Spicy cream cheese flecked with jalapeno provides the base for this delicious recipe. 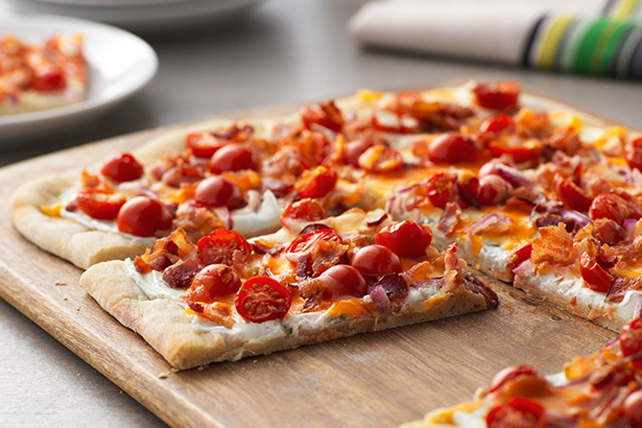 Topped with tomato, onion, bacon and more cheese, this flatbread will definitely become a favourite. Roll Perfect Parmesan Pizza Dough into 12x10-inch rectangle on lightly floured surface. Transfer to baking sheet sprayed with cooking spray. Spread cream cheese product onto dough to within 1/2 inch of edges; top with tomatoes, onions and bacon. Bake 10 min. Top with shredded cheese; bake 8 to 10 min. or until cheese is melted and edges of crust are golden brown. Prepare using 1 lb. (450 g) thawed frozen pizza dough.